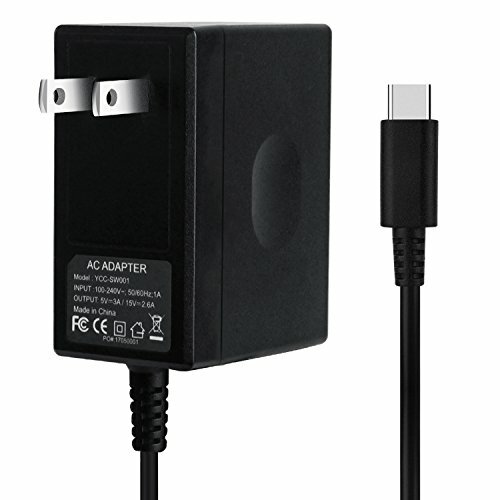 Unique Design - This Nintendo switch AC adapter chargerCompatible with Nintendo Switch dock station and pro controller. It supports handheld mode, also works for Nintendo Switch docking and playing on a TV. Enjoy big screen games with your family and friends in a comfortable room. Fast Charging - Same as original one 15V 2.6A. High speed charger for 3 hours in the case of running out of battery, the nintendo switch power adapter allows you to charge the switch quickly, even while you play. USB Type C Port - The premium attached extra long 5 Feet USB-C Integrated cable fit all type-C device. Input: 100-240V~50/60Hz 1A; Output: 5V 3A/15V 2.6A. Safe Enough and Multi-protection- Approved for CE-FCC-RoHS certification. The built-in \"smart PD(Power Delivery) IC\" & the thermal material design protect your devices against overcurrent, overvoltage and overcharge. Portable Size - It\'s small and lightweight, compact and easily portable fit into your handbag or backpack. Enjoy games experience anytime, anywhere with the Nintendo Switch Power Adapter.